Happy Sunday and Happy Father's Day. Happy Father's Day to my sweet husband, my best friend and the wonderful father to our two daughters and grandfather to our sweet granddaughter Abby. I have been with this man for 35 years and loving him is like breathing, easy and beautiful. We carved out a beautiful life together and continuing to live out our journey together just makes my heart sing. Terry I am so blessed to call you hubby, friend and soul mate. Enjoy this day in honor of the good man, dad and grandfather you are not to mention the handyman you are in my decor crazy world. I wanted to show a new window header Terry made me for the living room window. You know how I love to repurpose salvage into new things. 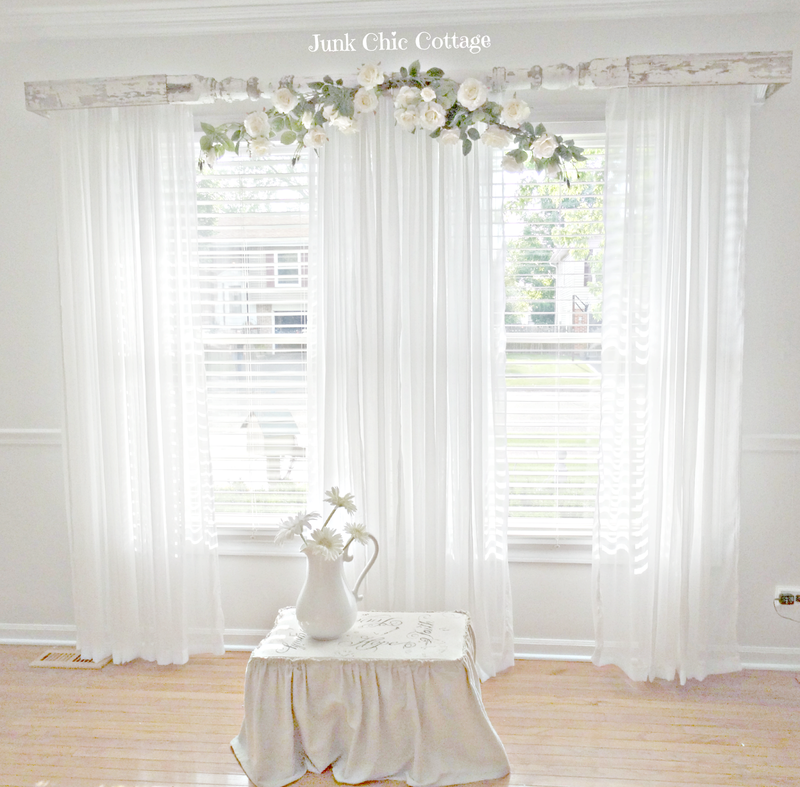 I am on a new course and getting back to the shabby cottage white that I love. 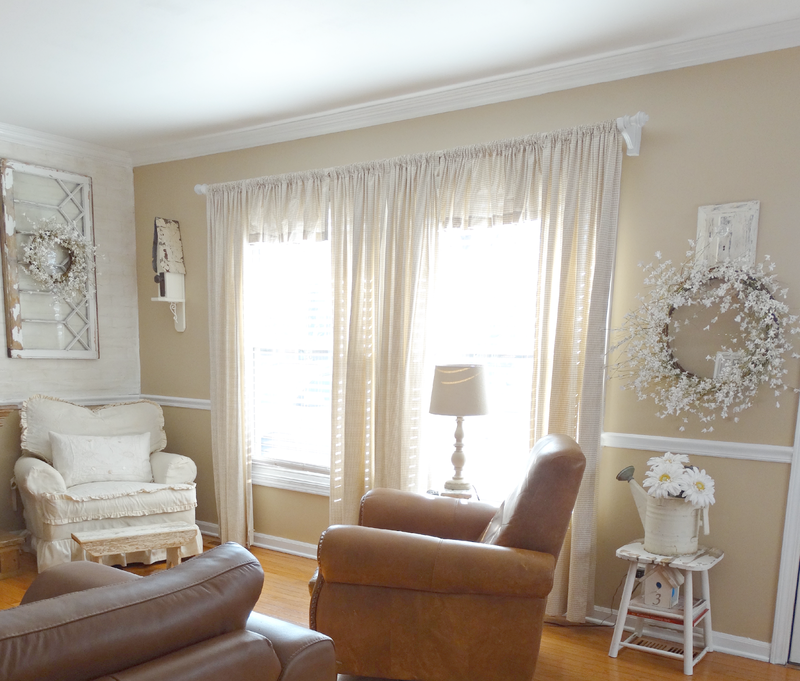 We painted the walls with Behr Cottage White which is one of the million colors of white they have!!!! It is a white with just a hint of gray tone to it. I love the soft serene feel it gives the room. I had Terry make me a header for this window out of some old chippy porch spindles. Terry attached them together and then added some old chippy wood pieces we had to make it long enough to fit the window. He went around the pole and attached the wood pieces to the bracket holding the curtain rod. Kept the rod underneath to hang the white sheers on. So this is the beginning of the transformation of my living room. The beauty is I am using paint I had from the hall way so now the hall that leads to the living room will all be the same color. You can see I get a lot of soft light in this room. I am going for a soft and serene shabby cottage chic room. Stay tuned for more things I am changing up for this room reveal. Of course this is fabulous, Kris! Another one of your great and fun ideas!! Your living room is looking gorgeous, Kris! And I love the beautiful words that your wrote about your husband. I hope you have a lovely day celebrating Father's Day. You amaze me at your imagination and how you transform and remake anything. Love it. Wow! A great idea and a fantastic start. The swag in the center gives it all a soft romance. My wheels are turning with what the changes may be. Don't tell me the leather furniture found a new home?? Beautiful! You have the best ideas and the willingness to work hard. There's nothing you can't do! it's like a dream, so beautiful! It looks very soft and beautiful, Kris. Happy Father's Day to your hubby! Now that is too darn cute! 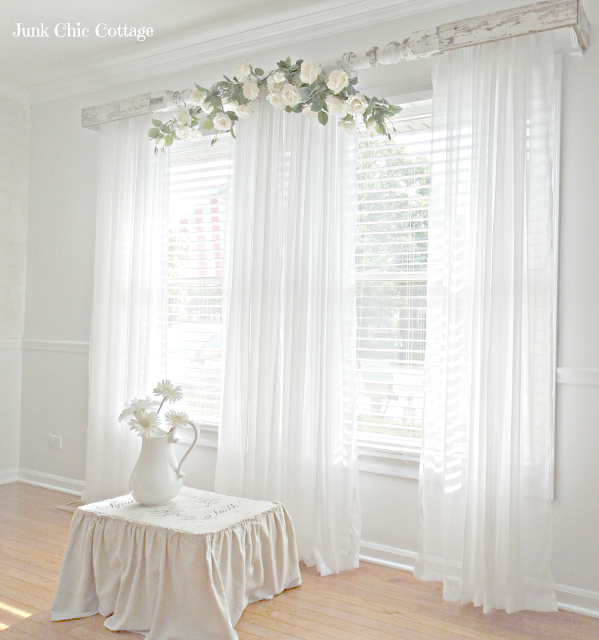 I love the header on the curtains and the softness of the paint color! Great choices! Hope you and the hubby have a wonderful Father's Day! Hugs!! Ingenious idea!! You come up with the cutest and smartest ideas! Love the softness of the look with the chippy thrown in there. Loving the white and what a smart idea for the header! What a beautiful way to add shabby eye candy to your curtains. You and Terry are so clever. Love it! Isn't it great to be married to a guy who can do anything?! Don't know what I would do without my hubby!! Please give my wishes for a wonderful Father's Day to Terry spent with family. Always fun to see your creative energy reinvent along side your hubby. White for you is always right! Wish my husband liked DIY. That is so creative, how the spindles are married together! Just lovely. You paint more than I do and I paint for a living LOL !!! Love the new header! You always amaze me with your beautiful decorating ideas! Very pretty! Didn't you just change this room.. LOL? Have a great week! Lovely post Kris! I love your husbands eyes! They stand out. I love the photo you shared of him today as well. And I am always amazed at your decorating. That looks so wonderful! Great job hubbie! The header is fabulous! You are such a tease, Kris! We are drooling to see more! Happy Fathers Day to Terry, that man is a saint! Fabulous! That rod is amazing and the white is gorgeous and ethereal! Loving it Kris!! Hope your hubby had a great day!! I love what you wrote to your husband, that loving him is as easy and beautiful as breathing. And I love the elegant simplicity of your window now! It was easy peasy to attach the two posts together. My hubby put a piece of wood behind the whole thing. So basically the pieces are all mounted on a piece of wood to make the header. Hope that helps. It is easy to do. Let me know if you have any other questions. I am excited for you that you will be making one of these for your window. I think it gives the window some personality. Have a great week. Good luck. What a great idea. It looks soft and romantic. I look forward to seeing more! especially to young people in our divorce riddled society. Hope Terry had a great Father's Day. So glad to here that y'all had a nice Father's Day yesterday. that is the neatest way to use an old spindle! I'm looking forward to seeing the new direction you're taking this living room. Hi Kris,. lovely tribute to your dear hubby for Father's Day. Love the new window and the soft light that streams in. 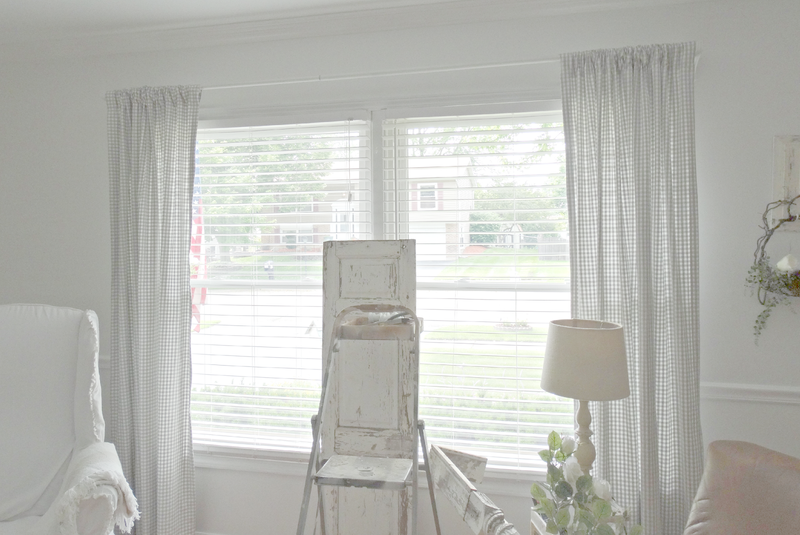 The spindles made the perfect window trim with your drapes. Simply love the wall color. So soft and peaceful. Hope all is going well for the job search and possible move. Prayers for you both. So happy your happy with you guy! A nice tribute to him and your relationship. Love the new window treatment and was very creative! All of us shabby girls need a 'Terry' in our lives... perhaps you can hire him out. He is at least already trained in all things shabby - lol. Love the changes you are adding to this room Kris. The header is a gorgeous shabby accent!! Oh so you, and adds that bit of nordic vibe to the room. Loving the white and leather, I have an armoir on its way that I will be making over for my front room it has leather inserts on the 2 doors I am looking forward to added a couple of shelves, as roughing up,that leather, now to leave it dark, or paint it in a ways of French greys. I am kind of liking the idea of a massive dark piece taking up space. What a tender tribute to your honey. You don't find true love that lasts like that anymore.....or should I say...not very often. Love the header over your curtains...so "you", Kris! I like the white on the walls too. Anxious to see what you do with the rest of the room. Hi Kris, I LOVEEEEE those curtain....so airy!!!!! Kris, what a sweet tribute to your hubby! He sure does wonderful honey do's for you. 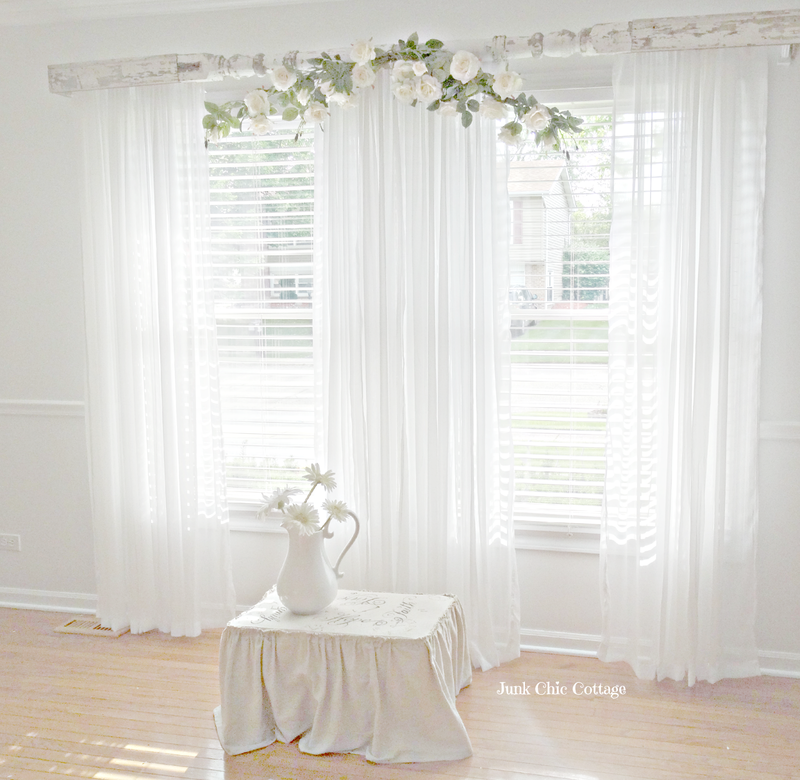 Love, love this wonderful new curtain header! That's a heart warming tribute, your living space looks really nice with the new colour and design. Best wishes!